Tangled and True: can-do crafts. I'm trying to be a better mother, and in doing so I've been dreaming up fun and easy projects to work on with my girls, a new kid friendly recipe, making play-do, finger painting, sidewalk chalk.. you get the idea. The sense of accomplishment they feel upon completion is one of the joys of motherhood in my opinion. I'm always on the hunt for fun, easy things when the "dreaming up" isn't cutting it and I often turn to Martha Stewart to keep me moving in the right direction. 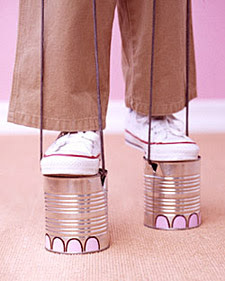 Tomorrows list of to-do's includes the can-feet above. I can hardly wait. Instructions available here. We used to do this as kids!! Nice reminder of a fun activity to do with our kids! thanks for the info carla. i have seen the creative family book and it is great! i'll have to check out the artful parent as well. cool idea! they have a plastic version of these at my daughter's preschool, but making them looks like far more fun! Those look so fun. I'm loving ideas like that for this summer with the kids. Thanks!! I love your blog! We had toys like these when I was little. They were our "Rainy Day Toys," only allowed out of the box on a rainy day when we couldn't play outside. They were my favorites of the whole "Rainy Day Box!" My son would love this! Thanks for the idea.